A diary of a yummy mummy and the jet setting baby. : Cannes here we come! I can not tell you enough how excited I am to be jetting off to Cannes this weekend. Poor DJ has had some virus, they weren't sure what it was, but he had a very high temperature and has now come out in a horrible rash all over his body. So that coupled with sleepless nights, we are pretty much running on zero. So with DJ on the mend, I am now turning my attention to what I am going to pack. Cannes is impossibly glamourous and of course is the home of the Cannes film festival. So far this is what I have in mind to pack. 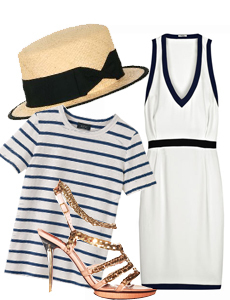 Little sun dresses, some black flats, pair of jeans and a my favourite stripy t shirt and stripy jumper, and a sun hat. I will of course be trying to channel one of my style icons Bridgett Bardot, seen below hanging out in Cannes. Ok I am off to pack..
lovely blog, these are some great shots!.i m regular user at your blog.Thanks for sharing amazing and beautiful Creations.